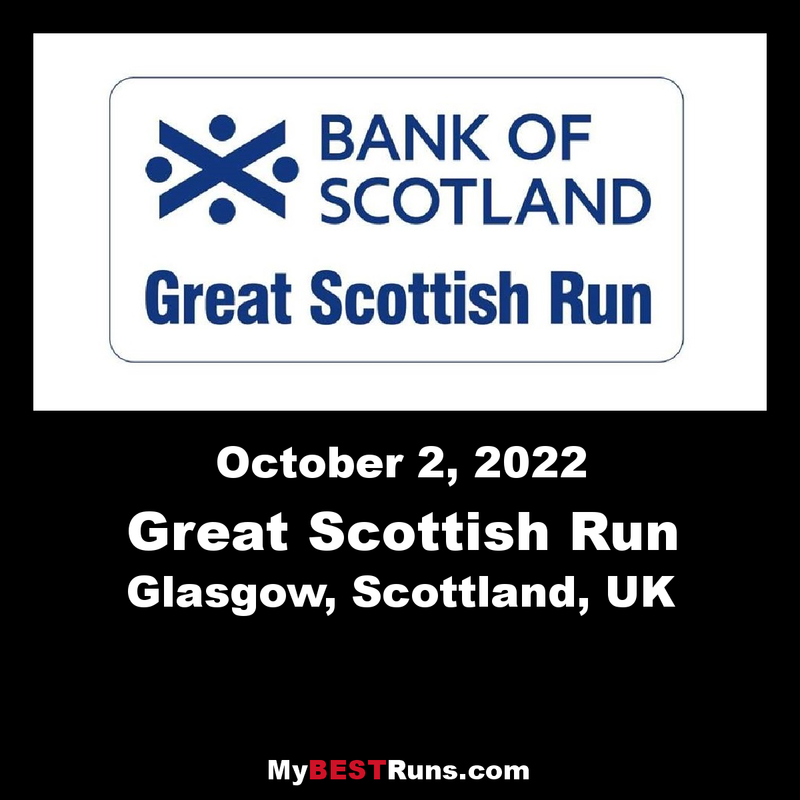 The Bank of Scotland Great Scottish Run half marathon welcomes thousands of runners to the city of Glasgow every year. 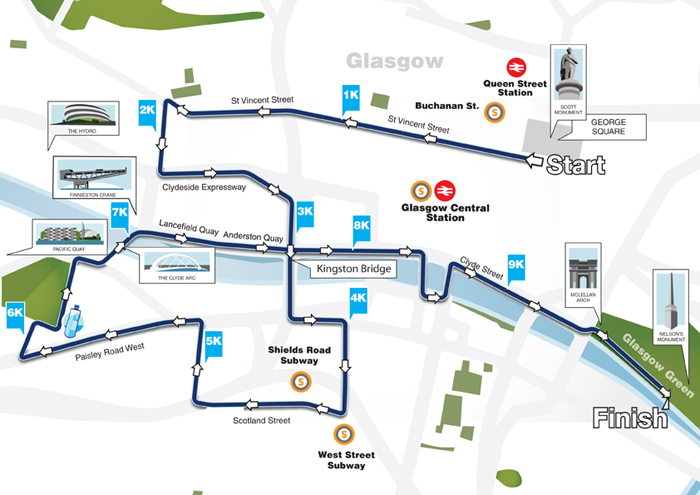 The course starts in the centre of the city, in George Square, and from there takes runners past a selection of Glasgow’s finest venues and buildings. As well as crossing over the River Clyde, runners will take a trip through Pollok Park and Bellahouston Park, before heading back for the grandstand finish on Glasgow Green. Join over 15,000 runners of all abilities in Glasgow. 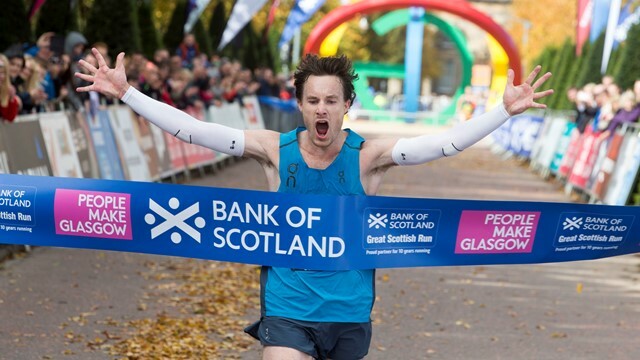 The Bank of Scotland Great Scottish Run 10k is the perfect way to see the stunning Glasgow sights, which include The Hydro, Pacific Quay and the McLennan Arch. 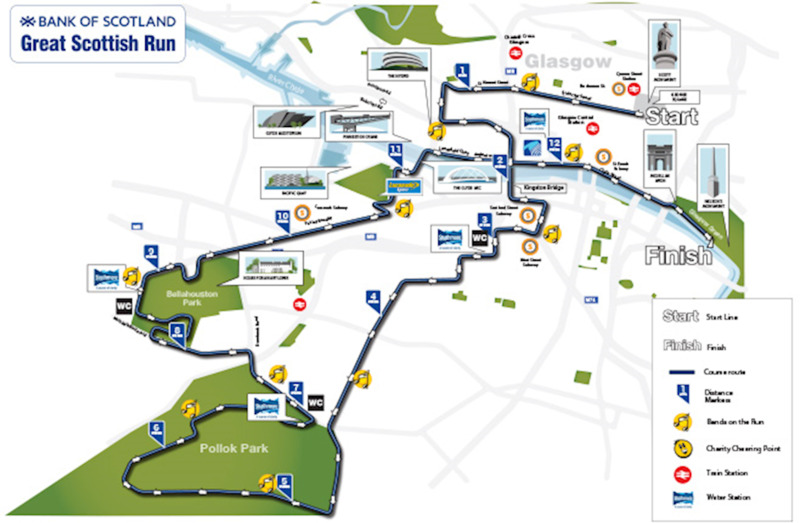 The course, which is a shorter adaptation of the half marathon, takes runners on a tour of the River Clyde and before heading back towards Glasgow Green for the big finish. We offer overall prize money and British only prize money. Prize money will only be awarded to elite athletes not athletes who run fast times from the mass start. Both Elite fields are restricted to numbers so apply early to avoid disappointment. Email andy.nixon@thegreatruncompany.comwith details of qualifying performances, name, DOB and club. The decision to take on 13.1 miles should not be taken lightly; it requires a good level of fitness and a dedication to training. The rewards for your hard work in the build-up however, are all worth it! The course will once again pass many of the iconic venues that feature in Scotland’s biggest city, including Nelson’s Monument, the Clyde Arc and the Finnieston Crane. Starting in George Square in the heart of the city centre. Runners cross the Clyde twice using the Kingston Bridge and Clyde Arc. From the city centre streets to the peace of Pollok Park – every mile is different. Strathmore water will be available at regular points along the route. There will also be a run-through shower around 8 miles. Entertainment along the route will include bagpipers, drumming bands, live music, charity cheering points and our ‘Wall of Sound’ zones.